We firmly believe that a yacht charter agency must create added value by providing local knowledge. This can be achieved only through familiarity with the destinations, experience in sailing, knowledge of the yachts and their crews, and passion for the sea and its culture. Every journey we organize is tailored upon our guests' requirements, so please contact us to request your private itinerary. All our voyages leave a very low carbon footprint. Check the pages of our magazine for more information. Check our Blue Prawn restaurant guide. The prudent sailor never casts off with the assumption that Nelson was right when he said ‘there are three excellent harbours in the Med: Mahon, July and August’. Strong winds, cold fronts, thunderstorms and squalls must be expected at any month, even if they are of course less common in summer. True, safe havens, coves and bays abound along the Dalmatian coastline, and the endless channels provide smooth sailing even in strong winds. But nevertheless some cons must be reported. First of all some anchorages look bottomless. So always make sure that you are leaving with a long and heavy anchor chain, a serious spare anchor, possibly a fisherman, and lines to lay ashore in constricted waters and/or for better protection. Second, the more or less complete absence of sandy beaches indicates that sand is unlikely to be the bottom your anchor will fall on. Rocks, grass and other delicacies are more likely, and none rank high among the preference of sailors. So set your anchor well, have a look at it whenever possible with your snorkelling gear and always choose to lay out warps ashore towards the direction of the stronger prevailing winds whenever possible. Trees and rocks are there to work as cleats, what else? The bad guys are Bora (NE), NW and SW. Bora can be very distressing. True, it comes from the shore, but it can kick up something nasty enough in a few miles, especially in the north and the Kvaerner. It is less to be feared S of Hvar, where southerlies are worse. Northerlies are usually associated to a cold front, so expect them to arrive when the barometer stops falling. Make sure the barometer works. Another drawback of the blessed geography of Croatia is the number of rocks awash or just below the water, especially around the Kornati archipelago. A chart plotter is a good help, especially if it is not a long walk away from the helm. But the best is always to follow the LLLL rule, lead, log, longitude and lookout. Keep an eye around and always be sure of where you are and what you are supposed to have below your craft. Contrary to their neighbours the Italians, Croatians understood well that Marinas can be a business and a service, and not a resource to be laughed at. Marinas are ubiquitous in Croatia. Clean, well sheltered, offering most services, well designed and not too offensive of the environment. They are not cheap, with a berth for a 40 footer at an average 50 euros a night. Most are managed by ACI. 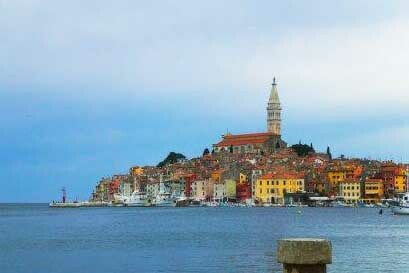 Some of them, like Hvar, Korcula and Dubrovnik, are very popular. So get there before 2 p.m.
First of all check well if the water and diesel dials of your vessel work. If you assume gentlemenship from petrol stations you will soon see the fallacy of your expectations. Water, they will say most of the time, can be found at the marina, and that dripping tap few feet to the left is just to quench the thirst of dogs, and the key is not at hand anyway. Try with the old system (T.I.P) or approach marinas when empty or before the attendants get there to wave you off. It is a matter of regret that so many people at sea nowadays are unable or unwilling to respect some of the most basic rules. So many times the blame goes to the tourist boats, whose captains seem to believe that their vessel raises no wake and that the other boats and their lines are just a pain in the arse. But the average sailor is no better. We kindly ask to every captain to raise no wake, make no useless noise, anchor at a respectable distance and try to sail in the most independent fashion. The importance of realizing that happiness is hard to achieve with an empty stomach cannot be overstressed. If you rented a bareboat or with a skippered boat, do not leave the harbour with a well stocked galley, because some cruising areas of Croatia are exceedingly devoid of groceries. Even more so if your palate is accustomed to a varied diet. This is very true in the Kornati archipelago, where it’s easier to find a tree than a loaf of bread. Most small villages can boast a grocery store, but the choice of food they offer is ghastly. They look deeply convinced that fish is born, grow up, spawns and dies in freezers. Same as chicken. Mutton is worth a note on its own: while in most places you do not see sheep around but readily find their corpses in butcheries, here it can be found roaming everywhere but they are probably immortals and the way to a good roast runs through bigger cities. Basically in Croatia you invert the shopping system that you use in the rest of the Med, where you stock up in staples in the bigger cities and have fun looking for fresh delicacies in smaller places. In Croatia stock up in supermarkets in delicacies, because the staples are easy to find everywhere. Among the NTBM (not to be missed) list of delicacies you must try in Croatia, a special mention goes to prawns and shrimps, Dalmatian ham, fresh fish in general in the Split area (San Peter’s and bass), fruits and vegetables (peaches are excellent), truffles. Beef should be preferred over chicken, and mutton is excellent but wildish in taste. Oysters around Dubrovnik, cheese from Pag, broiled sardines in Sibenik and Kali. Sausages and salami are very good, although far from Corsican perfection. Try beef or fish cooked in the peka, a utensil that is put under the burning coals. Around Hvar you have to try a Gregada, a fish soup in a very tasty stock. Then octopus salads and shellfish in general. While we noted with sadness that most fish goes straight from the boats to the restaurants, we also must remark that they make a very good use of it. Without being pretentious, the Croatian restaurants we tried work well indeed. As a matter of fact, when compared to their French and Italian counterparts in the touristy areas, they win hands down, with a greater genuinity, a higher respect for the client and a better price/quality ratio. Wine: Croatia doesn’t rank high in the ratings of world wine, and one does not take much to understand why. The price/quality ratio is depressing, and one is tempted to buy crown-cap, 1-litre bottles of white just to risk less. Some bottles we found very good, like some dry Malvasias, but with that money you buy better everywhere else, and, moreover, you can buy tons of excellent beer. Lasko, Slatorog and Karlovacko are some of the brands, but we must underline that Croatian and Slovenian beers do deserve a mention. Malty and hoppy, tasty at every temperature, tasting even if industrial, the drinker won’t be deceived. Kornat (crowned): if it’s nature, silence and landscapes what you are looking for, this wind-swept, rock-barren and sage-scented island is your destination. It looks like a long wave of stones recently emerged from the blue waters, where no trees had the time to grow. Sail along the W side and explore its many bays, among which we report Opat (the S-most) with its excellent restaurant, Lopatica and Vrulje (the restaurant here has been reported ghastly). It’s hard to find an unpleasant corner here. Find your own private bay, also using the many small islands and coves lying W of it. We suggest letting go in a bay in the evening, hike up the hills and scan the view to find your favourite bay for the following day. The Kornati N.P. is not cheap, at 10 euros pppday, collected by employees with fast dinghies in most anchorages. Smokvica (small fig): this small island lies just S of Kornat and boasts two bays, the westernmost of which is simply amazing. Horseshoe-shaped, it’s protected by a low saddles stretching between two low hills and you can see other islands on the other side but not the sea in between, so that in clear days you have the exact sensation of being anchored in an alpine lake. Lavsa: this beautiful island shelters a bay (with cosy village attached) that is one of the favourite havens of the archipelago. Not very roomy and somewhat shallows to accept many vessels. 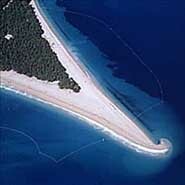 Piskera: On this tiny island situated along the ‘outside passage’ you find the only marina of the Kornat National Park. Rather shallow for many boats, it’s nonetheless superbly located and has a very good anchorage right S of the marina. Pristine waters indeed. 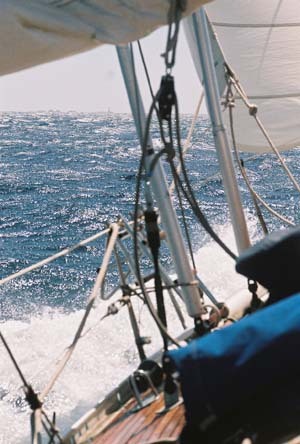 The Outside passage: we strongly recommend sailing along the W-most line of the islands, with the open Adriatic to the W. The islands drop their balanced look, their wobbly look and acquire a more dramatic drop, a cliffy air and a rugged look. True, shelter is hard to achieve but it’s a great place to sail, to tack close to the granite walls and to have fun. Telascica: the second NP of the area provides quite a different atmosphere being, as it is, mostly enclosed in a wide and fully sheltered bay with several coves on the side and a lake for hiking virtuosos. Cheaper than Kornati (and the guys carry away your rubbish as well, a great added value) at 7 euros pppd, it delivers the sensation of sailing in a Swiss lake, surrounded by pine trees, gentle slopes and cosy inlets. One of these opens right NW of the NW entrance point, a 1/3 mile deep and narrow inlet where you can let go and lay out lines ashore, thence climb the cliff for heroic dives. Waters are always calm around this bay, a perfect winter harbour, a place where you can spend days exploring. Zjrie: situated on the same itinerary, ideally cantered around Sibenik, this island boasts one of the finer bays around, in its SW side. Gentle hills and pastoral woods surround a large cove that would be perfect if the depths were a bit more human. Krka and Skradin: the shrewd sailor who rents his vessel in Sibenik has the lucky chance to start his cruise sailing up the Krka River as far as Skradin, whence he can join one of the tour boats and visit the Krka falls. The Mediterranean sailor is unaccustomed to long inlets, poor chap, and indeed I cannot think of anything deeper than a cove all along the Italian 7,000-km long coastline, with the useless exception of mosquito-pestered lagoons where no sane person would ever dare to dip his toenails. So the Krka River is a pleasant surprise and nature decided to oppose no dangers to the sailor. Let go in front of Skradin, set your hook very well and explore. Skradin itself is definitely worth a mention, also for the food-curious. The falls in themselves are, even for a sub-junior globetrotter, a trifle overestimated. Primosten: still reasonably in the same cruising grounds, this pleasant walled town is a fair ‘entrée’ to its more acclaimed sisters to the south. Walk around the ramparts and explore the cemetery, where you’ll find rock-engraved evidence that the commonest Dalmatian name is indeed Ante. If you start your cruise from Split or thereabouts your natural cruising destination will be the archipelago composed by the big islands of Hvar, Brac, Korcula and their smaller sisters. Hvar: widely acclaimed and heavily visited, the medieval Venetian town of Hvar is worth its fame. The square, the alleys and the well preserved grey-stone houses with green windows are impressive, even is slightly overcrowded. 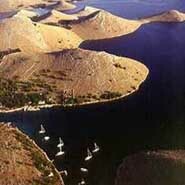 Let go or moor in the famous island in front and catch a ferry to avoid the lunatics in the Hvar harbour. The Palmezana Marina is excellent and if you hike 5 mins up the hill and you eat at Meneghello’s (try their Gragada) you won’t regret to be 15 minutes ferry away from the town. Scedro: this small island lies to the S of Hvar and it’s lightly inhabited, and the three coves in the SE corner are totally deserted, well sheltered and definitely worth a stop. Blue water and green trees. Milna: unjustly forgotten for some reason by many local skippers, one should get into Milna harbour at night. Well sheltered from most winds, the inlet sails you right in the middle of the town, as if the square had been invaded by the sea. One can clearly see that it’s not half as trendy as Hvar, but… well, we like it. Probably to put a marina in this bay has been a harsh decision. Maslinica: first stop on the way south from the rest of Dalmatia, this haven lies on the W end of the island of Solta that doesn’t offer much else. But we loved this place, its tranquil waters, its misty islets, and its cosy waterfront and, last but not least, the magnificent restaurant in the castle. The latter is owned, so sailor-radio says, to the German chap who invented cell phone roaming and who is therefore supposed to be well off. He did a great job, food is great and the service is top choice. Mljet: it’s hard to find a more beautiful island around. Long, deeply forested, with blue bays, a lake in the middle with a monastery on it, protected by a NP status, and blessed by a perfect coastline. Begin at Polace, a group of bays and islands on the NW side. If you don’t have a 90 metres chain let go in the shallow area close to the NW entrance, in 7 metres, decent holding. Then explore a perfect horseshoe-shaped cove at the W end. The entrance looks shallow but we sounded 4 metres in mid-channel. The first sandy beaches (coming from the N) are reported in the two coves in the SE side of the island. 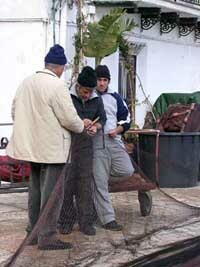 Vis: we do not have first-hand knowledge, but this island is another favourite of the local skippers. They warmly recommend the fishing village of Komiza and the blue caves of Mezuporat on the islet of Bisevo. Korcula: as Venetian maritime towns go, this borders perfection, with the circular alleys surrounding a hillock with regular church on top. A must see. Unfortunately it’s on everybody’s route, especially the gullets’ that at 6 p.m. assault the dock and raft to each other creating a shanty-town effect. The ACI didn’t improve things lying off a long concrete wharf E of the harbour for a dubious sheltering effect. Visit Korcula off season or, if you cannot, stroll around and shop in the afternoon, then sail W for 5 miles until you reach a very pleasant, well sheltered sandy bay where to spend the night in total tranquillity.